Look on any serious off-road Jeep« and you will find polyurethane suspension bushings. Unlike common rubber bushings, which lose their shape and get softer over time, self-lubricating urethane bushings last and last. Polyurethane is not susceptible to the elements that destroy rubber such as oil, road salts, ultraviolet rays and dry rot. 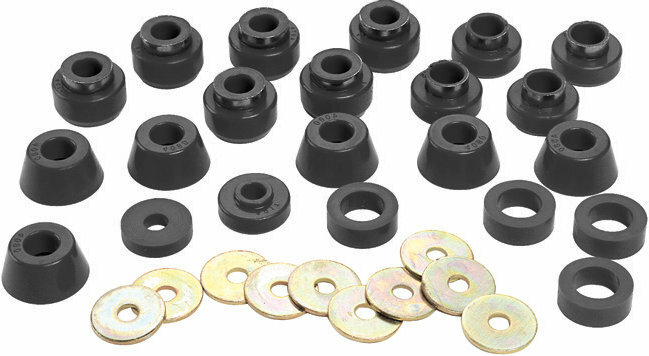 Energy Suspension's specially formulated polyurethane body mounts combine the best qualities of softness for a smooth ride, yet are rugged enough for the most demanding off-road trails. Mounts have a steel ring molded into the end for added durability, no matter how harsh the terrain. CJ Kits do NOT include body mount washers.